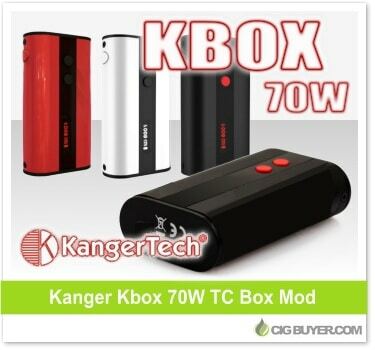 The Kanger Kbox 70W Mod is one of the newest devices from Kangertech, building upon the Kbox series and offering up 70W of power with temperature control; firing nickel (Ni) or titanium (Ti) coils as low as 0.1 ohms. Despite it’s long-lasting 4000mAh battery, it’s surprisingly thin and includes two line OLED display, micro USB charging port, and spring-loaded 510. It has a sleek appearance and comes in three attractive colors; an outstanding plug and play device at an affordable price.